This is a very quick and easy toddler activity to put together and all for free! All you need is an empty tissue box and something to post. Most of us have something lying around that will do; pegs, long Duplo blocks, cutlery, old credit cards, dominoes, popsticks or whatever you can find. Make sure that the material does not pose a choking hazard, demonstrate what to do and let them at it! For the younger child, simply make the posting hole larger. An older toddler will enjoy the challenge of having to place the item in exactly the right position to get it in. A great activity to use for mat time, playpen time, or even highchair time if the child is tall enough to be able to see the top of the box. 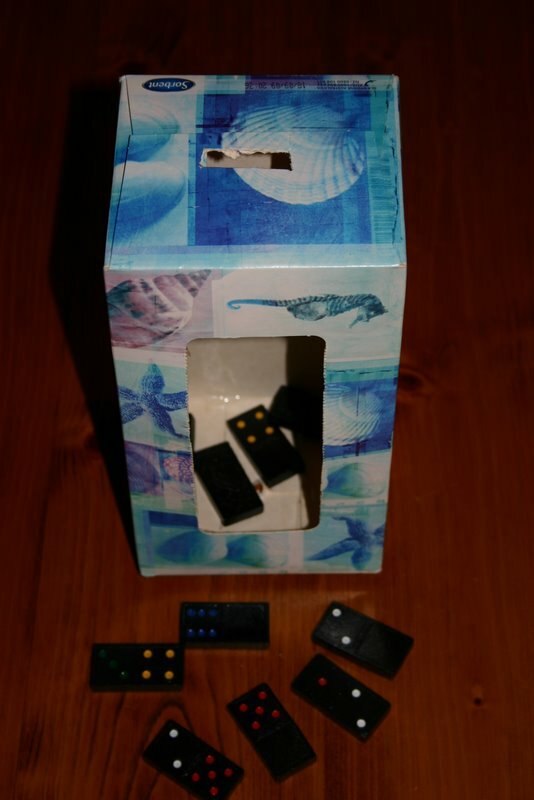 posting given object (in this case dominoes) through a slot in the top of a tissue box. Please see my pages titled “Workjobs and Learning Styles” and “Brief Montessori Overview” for more information.